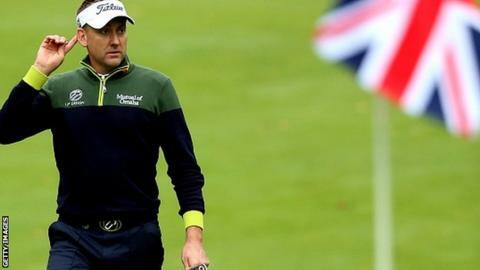 Ian Poulter hopes to win his first title in three years when the British Masters returns to the European Tour this week after a seven-year hiatus. Poulter, the official 'host' at his home club of Woburn, will tee off along with the likes of Lee Westwood and Luke Donald on Thursday. Seve Ballesteros, Greg Norman and Nick Faldo are among past Masters winners. "The names on the trophy are all of the great players that I've followed through the years," said Poulter. "You can name one after another after another. It's good that we've got a good field and we can put another great name on that trophy." Poulter, 39, has had four top-10 finishes this season but has not won a tournament since November 2012. "It's hurt a lot," said the Englishman. "I'm not getting any younger and the guys are getting younger and better. "It's been difficult and that's hard to take as someone that has pride in himself, in winning a lot of consecutive years in a row. "But the only way of dealing with that properly is going out there and winning. I need to do that. I expect myself to do that and I would expect myself to do that pretty soon." Former world number one Westwood, who has returned to the European Tour after moving back to the UK from Florida for "personal reasons", is also looking to recapture some form at Woburn. The 42-year-old won the Indonesian Masters in April but has slipped to a world ranking of 44th and needs to remain in the top 50 to secure entry to majors next season. Westwood is going through a divorce and wants to live closer to his two children, adding his game has suffered because "mentally a lot has been going on which has affected me in the head". He said: "Living in the States, my game didn't really move in the direction I wanted it to, but obviously that's not the reason I'm doing all this. "I've always had priorities in life. I've always said that golf is not my main priority, but obviously the kids are." "There's magic wand you can ever wave. I'm prepared to work hard. I'm in pretty good shape." Poulter will begin on the 10th tee at 08:20 BST with Miguel Angel Jimenez and last week's Alfred Dunhill Links Championship winner Thorbjorn Olesen. Westwood, Jamie Donaldson and Byeong Hun An will tee off at 12:30 on the first, ahead of Danny Willett, Thomas Pieters and Shane Lowry. England's Willett can replace Rory McIlroy as leader of the Race to Dubai with a top-two finish.